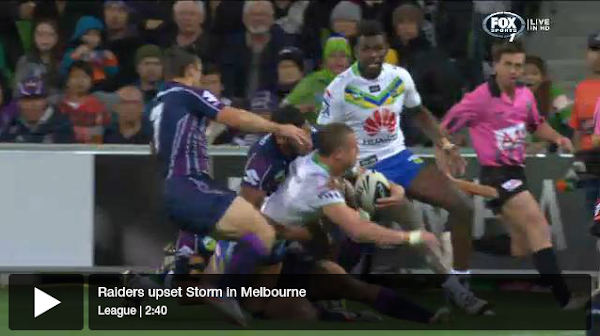 Melbourne Storm’s unbeaten run has come to a crashing halt with Canberra upsetting the NRL champions 24-20 at AAMI Park. With live-wire centre Blake Ferguson leading the charge through two first half tries, the Raiders survived a late Storm revival for a well-deserved victory. yeah Reece, probably would make origin for qld, if it weren’t for Slater and inglis. Maybe a wing spot if he is lucky or injuries happen. Heroic effort by the Raiders forwards, playing with 2 on the bench for most of the game (before Picker’s strange return after a concussion, which I’m sure the NRL will investigate).